Adolescents face unique pressures and worries. Will they pass high school? Should they go to college? Will they find love? And what ways do they want to act in the world? The uncertainty surrounding the future can be overwhelming. Sadly, and all too often, if things don't go smoothly, adolescents will begin labeling themselves as losers, unpopular, unattractive, weird, or dumb. And, let's not forget the ubiquitous 'not good enough' story that often begins during these formative years. These labels are often carried forward throughout life. So what can you do, now, to help lighten this lifelong burden? The Thriving Adolescent offers teachers, counselors, and mental health professionals powerful techniques for working with adolescents. Based in proven- effective acceptance and commitment therapy (ACT), the skills and tips outlined in this book will help adolescents and teens manage difficult emotions, connect with their values, achieve mindfulness and vitality, and develop positive relationships with friends and family. 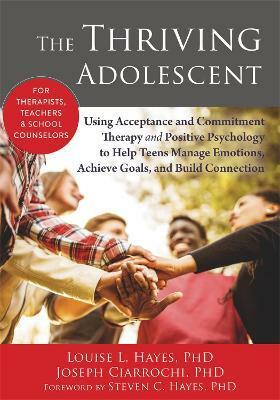 The evidence based practices in this book focus on developing a strong sense of self, and will give adolescents the confidence they need to make that difficult transition into adulthood. Whether it's school, family, or friend related, adolescents experience a profound level of stress, and often they lack the psychological tools to deal with stress in productive ways. The skills we impart to them now will help set the stage for a happy, healthy adulthood. If you work with adolescents or teens, this is a must-have addition to your professional library. "Listen up counselors, teachers, and primary care clinicians. If you care about adolescents and helping them flourish, this book is for you. The authors provide a theoretical basis to support 'DNA-V conceptualization' of adolescent evolution, and they make intervention easy with downloadable worksheets. Read it, apply it, and take pride in the fact that you are more able to love, protect, and equip tomorrow's leaders." --Patricia J. Robinson, PhD, director or training at Mountainview Consulting Group, and coauthor of Real Behavior Change in Primary Care "This is a long-needed book. The combination of Hayes's and Ciarrochi's expertise in clinical and research work with adolescents contribute to make acceptance and commitment therapy (ACT) simple to apply even for those who are new to this third-generation cognitive behavioral therapy (CBT) approach. Their DNA-V model is robustly grounded in the ACT research tradition. The authors distill its essence into three core behaviors, making it easy to build psychological flexibility and openness to the world and to any experience (which is basically what is needed by any adolescent in the world). There is no need to be an ACT expert to practice the DNA-V model, but you will become that expert. Exercises and metaphors are specifically tailored within a developmental frame and with adolescence in mind to help the reader become the context that models, instigates, and reinforces DNA skills in young people. This book should be read (and practiced) by any person interested in adolescence, or in being a therapist, counselor, teacher, or simply a parent." --Giovambattista Presti, associate professor of psychology and coordinator of the undergraduate program in psychology at Kore University of Enna, Italy "The Thriving Adolescent contains a great deal of wisdom and understanding of young people, and a practical approach to working with them in a developmentally attuned way. There are few clear and practical blueprints for this vital work, and the model the authors have crafted will be a useful addition to the repertoire of clinicians." --Patrick McGorry, AO, MD, PhD, FRCP, FRANZCP, executive director of Orygen, and professor of youth mental health at the University of Melbourne "The Thriving Adolescent moves beyond traditional behaviorisms to present a new perspective on engaging young people in vitalizing relational ways. The book is rich with ideas at the interface between positive psychology and youth development, and with practical strategies for helping young people identify meaningful goals and life values. Hayes and Ciarrochi map out many useful and concrete pathways for adults to build constructive, facilitating relationships with teenagers that can contribute to flourishing on both sides of the dialogue. Definitely advances the field." --Richard M. Ryan, professor at the Institute for Positive Psychology and Education at the Australian Catholic University "How I have longed for this book! It's an invaluable resource for helping teenagers to grow into their full potential and live life full out. This book is an engaging and clear road map with its practical suggestions, worksheets, exercises, and examples. It's a must-have for teachers, counselors, and health professionals working with adolescents." --Fredrik Livheim, licensed clinical psychologist, clinical researcher on ACT for teens at the Karolinska Institutet in Stockholm, Sweden, and coauthor of The Mindful and Effective Employee "This book is not about psychopathology. It is about that struggle for identity and becoming that happens in adolescence. Hayes and Ciarrochi offer a comprehensive developmental approach built on the best available science. It contains well-thought-out theory to ground the work and is packed with tools, transcripts, and real-life examples to make it readily accessible to any teacher, counselor, and health care professional." --Kelly G. Wilson, PhD, professor of psychology at the University of Mississippi and author of Mindfulness for Two "This is an excellent resource written by two eminent thinkers and skilled practitioners. Every chapter is filled with creative exercises, metaphors for explaining complex ideas, and scripts that can be fine-tuned for each teenager you're trying to help. With step-by-step strategies, this book is a road map for leading adolescents toward a better life." --Todd B. Kashdan, PhD, professor of psychology at George Mason University and coauthor of The Upside of Your Dark Side "This book breaks new ground in our understanding of how to nurture the development of adolescents. It translates the acceptance and commitment therapy (ACT) perspective into a strategy for helping young people develop social and emotional competence. I expect that it will enable schools, families, clinics, juvenile justice works, and communities become much more oriented toward ensuring that young people become caring and productive members of their communities." --Anthony Biglan, PhD, senior scientist at Oregon Research Institute, and author of The Nurture Effect "Reading The Thriving Adolescent sets you on a journey into the hearts and minds of young people in a way that is unique, fascinating, and incredibly informative. From the beginning, I felt compelled to reflect upon how, as a therapist, my goal was always to help distressed adolescents adapt to the adult world. This book turns that assumption upside down and asks us instead to help adolescents linger longer in their journey to adulthood by cultivating their abilities to notice what is going on in their world; to detach from destructive, self-focused mental chatter; and to be playful and experimental in their behaviors. Just as it takes a village to raise a child, it takes a prosocial approach like the DNA-V model to give us a sense of direction with a distressed adolescent. This book is packed full of revealing insights, interesting case examples, therapist-client dialogues, practical clinical tips, teaching protocols, and worksheets. All of this is done in an easy-to-read, conversational, and entertaining style. The Thriving Adolescent addresses the social landscape of adolescence, from the intricacies of developing healthy self-narratives to creating naturally occurring prosocial groups that help adolescents discover the practice of kindness to self and others. This book is a must-read for teachers, school counselors, therapists, and anyone else who wants to help teenagers thrive." Louise Hayes, PhD, is a clinical psychologist and academic with the University of Melbourne in Australia. She has devoted her career to helping young people and their families.